Want to keep your album proofing process even more organized and clear for clients? Consider creating a new version of an album for each round of revisions that you receive from your customers. When is it best to create a new version? This depends on your workflow and the feature is completely user directed, so you can create a new version anytime you think it's helpful. You are never forced to create a new version and can continue to work on a single version if desired. That being said, anytime new comment sets are received from your client or if substantial changes are required (e.g. : removing or replacing spreads), creating a new version will provide great value and clarity. NOTE: Choosing not to create a new version, means that certain changes will not be tracked (i.e. : identifying removed or replaced spreads) and the comment history for each spread will remain in a single thread, which could lead to confusion if the amount of comments grows or lots of changes are made with design revisions. What happens when I create a new version? First a new version is recorded in the system and given both a version number and date. The current layouts will be duplicated to the new version and are ready to be edited/updated as needed. If it's the first new version created for the album, a drop down navigation will now appear in your Album View and on the client presentation, where your client can easily reference previous versions. How do I view the various versions? 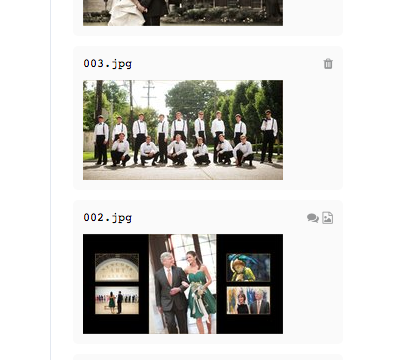 From the Layouts page or the Album View, you may select a previous version at any time. Once selected, the spreads and comments will show specific to that version. This way, you can see the comments specific to the design at that time and during that particular revision period. The current version will always be the default view for both you and your clients, however in your account, when selecting a previous version on the Layouts page and then clicking the button to 'View Album', the version in the Album View will remain the one you have selected on the Layouts page. This way, you can smoothly reference multiple versions moving back and forth between views as needed. How do I know what was changed on previous versions? We include several indicators to make referencing changes easy on previous versions. These icons will show in the top right of the spread on the Layouts page, if applicable. What can I count on being saved? Each version will save the spread files (with file names), the order of the spreads, and the comments associated with that spread. So, even if a file is removed in a later version, the file in the previous version(s) will remain and maintain it's information and comment history. Can I still view the Full Comment History? Yes! We realize that seeing the entire conversation on a spread can be really valuable, so while versions may break that up into specific rounds, we've included a view called 'Full Comment History' which allows you to see the current view but with all comments. Versioning is not supported in the Design Review stage - since the Design Review stage is a relatively 'short' step in the workflow, we didn't want to create an added layer that might slow or complicate the process unnecessarily.